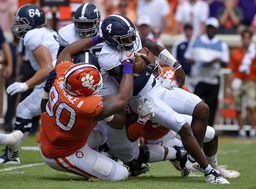 NASHVILLE, Tenn. (AP) NFL teams showed some preference for quarterbacks, as always, and an infatuation with players who protect them and disrupt them during the first round of the draft. Maybe for the next two rounds they will go after the speed demons and running backs who, in many cases, fell through the cracks as the trenches were filled with the behemoths who work there. In all, 12 defensive linemen and five on offense were chosen Thursday night after Oklahoma quarterback Kyler Murray went to Arizona and became the second consecutive Heisman Trophy winner from his school taken atop the proceedings, following Baker Mayfield to Cleveland in 2018. Two more QBs went: Duke's Daniel Jones to the Giants at No. 6, a bit of a surprise, and Ohio State's Dwayne Haskins at 15, where the Redskins sat patiently and saw him fall into their arms. Add in three linebackers and two tight ends and the theme of opening night becomes clear. There are two more blockers remaining, Oklahoma guard Cody Ford and Florida tackle Jawaan Taylor. They are among five players invited to the draft who didn't go yet but almost surely will Friday night. Also remaining on the board after receiving much higher projections are Missouri quarterback Drew Lock, Mississippi wide receiver DK Metcalf, and LSU cornerback Greedy Williams. Metcalf is fast, strong and powerfully built, with many evaluating him as the best wideout in this crop. At one point, Williams was regarded as the top cornerback available. Lock falling out of the opening round, given his position and the near-obsession with filling it with a high pick, was unexpected. Ford and Taylor have starter potential for 2019 regardless of where they land. Others still on the board who had first-round grades from some clubs include Washington cornerback Byron Murphy; Mississippi receiver A.J. Brown; Delaware safety Nasir Adderley; Ohio State WR Parris Campbell; Alabama TE Irv Smith; and Texas A&M center Erik McCoy. Further emphasis on defense shouldn't be a stunner. This is one of the deepest drafts for that side of the ball in recent memory. 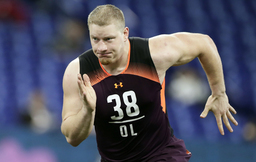 Atlanta had room for two likely starters in front of QB Matt Ryan: Boston College guard Chris Lindstrom at 14 and, after dealing back into the opening round, Washington tackle Kaleb McGary at 31. Ryan was sacked 42 times and took 108 hits, a career high. Speed and elusiveness wasn't ignored in Round 1, of course. Start at the top with Murray, who can run with anybody in this crop. Arizona defied NFL custom and at least temporarily created a quarterback quandary by selecting Murray to start proceedings in a wet and wild selection show. 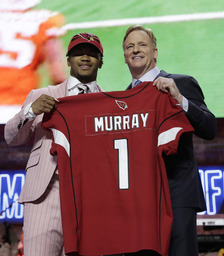 As thousands of fans withstood rain that began just about when Commissioner Roger Goodell spoke Murray's name, the Cardinals spent a second straight high pick on a signal caller. Arizona moved up from 15th overall to 10th in 2018 to grab Josh Rosen. NFL teams simply don't do that, but with a new coach in college-trained Kliff Kingsbury, the Cardinals made the bold move. At least until they likely move Rosen elsewhere in a trade. Murray was one of only three Big 12 players taken, along with teammate Marquis Brown, a wideout headed for Baltimore, and TCU defensive end - what did you expect from this draft? - L.J. Collier. The Pac-12 also had only three, while the SEC scored nine, the ACC had eight, and the Big 10 had seven. 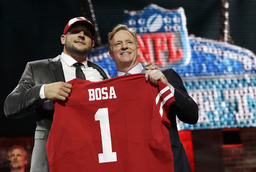 Ohio State edge rusher Nick Bosa went second to San Francisco as expected. 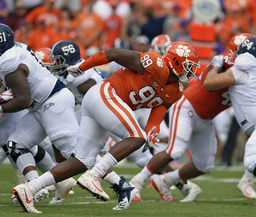 The 49ers have used a first-round selection on four defensive linemen in the past five drafts. Bosa's older brother, Joey, plays for the Chargers and was the 2016 Defensive Rookie of the Year. Their father also played in the NFL. Across the Bay, Oakland had three selections: Ferrell, Alabama's Josh Jacobs, the lone running back to go Thursday, and Mississippi State safety Johnathan Abram. The Giants also went three times, getting Jones, Clemson DT Dexter Lawrence and, after trading back in for the 30th spot, cornerback DeAndre Baker of Georgia.